I have missed this world so much, so when I saw Impostors sitting on the display table in my local Waterstones I pounced on it and then gushed about the whole Uglies universe to the bookseller for a good ten minutes as I paid. Because Uglies is one of my favourite series and I'm so excited that it's continuing. Frey and Rafi are inseparable... Two edges of the same knife. But Frey's very existence is a secret. When her father sends Frey in Rafi's place as collateral in a precarious deal, she becomes the perfect impostor-as poised and charming as her sister. But Col, the son of a rival leader, is getting close enough to spot the killer inside her. As the deal starts to crumble, Frey must decide if she can trust him with the truth and if she can risk becoming her own person? With Impostors, master storyteller Scott Westerfeld returns with a new series set in the world of his mega-bestselling Uglies-a world full of twist and turns, rebellion and intrigue, where any wrong step could be Frey's last. 5 Words: Family, power, control, betrayal, revenge. When I heard about this book I was so excited - I loved the Uglies books growing up. I loved the twisted world, the acerbic take-down of societal conceptions of beauty. And now I'm back in the same world watching a similar take-down of the people in power. and it's excellent. I loved the changes in the characters, how the Frey from the first page isn't the Frey from the last page, how the truth about Rafia is slowly revealed. I loved that there was so little trust and so much hope, so much pretending. There is a bit of romance in the story, but it's not front and centre. To be honest I could very easily ignore it. It felt a bit convenient, and with the relationship between the particular characters it often felt more like an emotional outlet and a bit of mutual attraction than anything serious. The ending is spectacular. This book is a bit of a thrill to read, packed with action and battle scenes, the hard reality of Frey's life is there on the page and explored in her every action. But that ending left me desperate for more. Impostors may be the fifth book in the Uglies world, but you don't need to have read any of the other books first as this is set in a future timeline and generally deals with different characters and cities. Have you read any of the Uglies books? What's your favourite fictional power struggle? I loved Uglies, so I definitely think I'll like this! 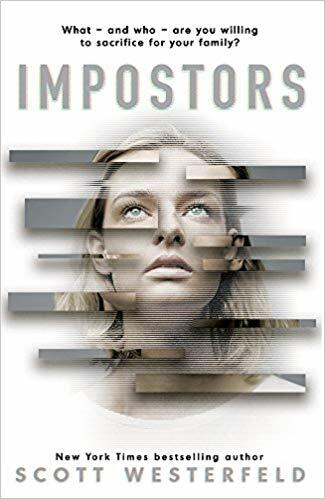 I loved the Uglies series and I'm definitely going to be reading Impostors but your review has made me even more excited for it!